Baseball Playoffs/World Series Pool at tomorrow's meeting! President elect Judy Christensen opened the meeting by leading the Pledge, Kris Engstrom shared a prayer in reflecting on a " Studdering start to Spring". April 20 Becca Lindenmeyer – Landscape design incorporating water design. Decendent from Lithuania 1880's and the Textile industry. His parents were married in 1920. His father was a doctor, after graduating from Cornell University ( 1915-17 ). His Mom was only 13 when his dad was in college. Sam would use his date script pad to write notes to get out of school (not the most honest Boy scout). Many years working at Walter Reed Hospital as a Military occupational therapist. Working with children and vets. Learing many stories from vets reliving the war. With daily losses of solders lives. Sam took a job at UVM in 1970 and successfully graduated 1100 students. After retiring he met Colleen and Linda and became invovled in Hands to Honduras, then joined Rotary. Sam then worked with Clarkson University. Sam had dinner with Hillary Clinton, subsequently received a grant. Sam and Gail are proud of their childern and their succesful careers. We all in Rotary should be very thankful to have Sam with us. Posted by Judith A. Christensen, Ph.D. This is at the Tela rotary meeting last night. Our volunteer Alan presented his flag from his Connecticut club. We have a request from Bruce Pacht, our district governor, to ask members to take a moment and complete the attached survey. Wednesday, May 14, 2014 7:30 a.m.
Wednesday, March 26, 2014 7:30 a.m.
President Dave Jonah called the meeting to order and led the Pledge of Allegiance. Kris Engstrom gave her usual apt devotional – including an optimistic look for spring. Dave introduced our guest (and speaker) Joe Sinagra from Myers Containers. He also circulated a stack of thank you notes from local worthy causes who had received donations from the club. Club members are encouraged to attend and if you plan to attend (it’s free) be sure to go to the website and sign up. Even if you have already signed up to be a volunteer to help with registration or as an ambassador, you need to sign up as a participant so the hotel has the right numbers of attendees. Elaine dates, Program Chair for the Conference reported that Richard Fox and Linda Gilbert are almost finished with the details of the program. It’s been a real team effort. 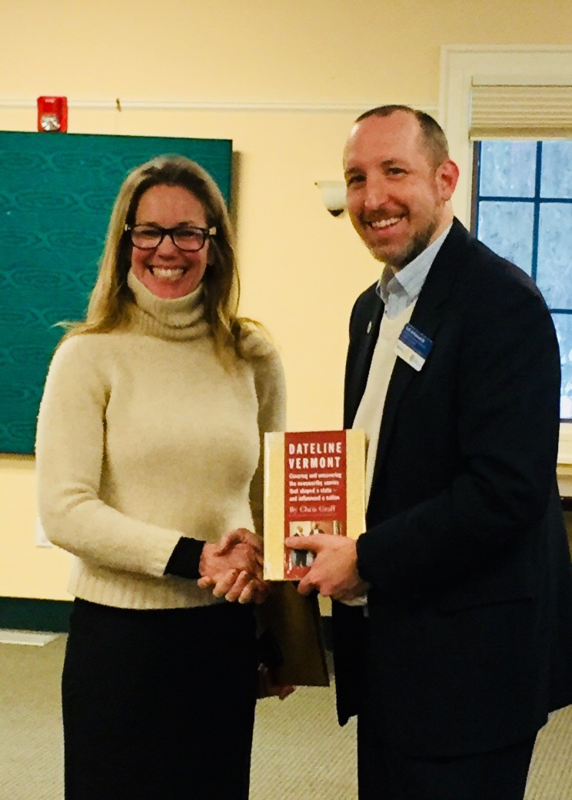 Dave expressed Shelburne Farms’ appreciation for the great work of the Rotary volunteers who directed traffic and organized parking for Saturday and Sunday last weekend. The volunteers for those two days were Bill Deming, Bob Sanders, Richard Fox, Denny Bowen, Tod Whitaker, and Doris Sage under the stalwart leadership of the Parking Czar Bill Root. Bill, who has been organizing Rotary’s volunteer parking projects at Shelburne Farms for 12 years, expressed thanks to the volunteers who braved the cold winds to make everything run smoothly. Ric Flood reported that all is under control for the annual bowl-a-thon, our biggest fundraiser of the year. The bowl-a-thon will be held in June at Champlain Lanes. 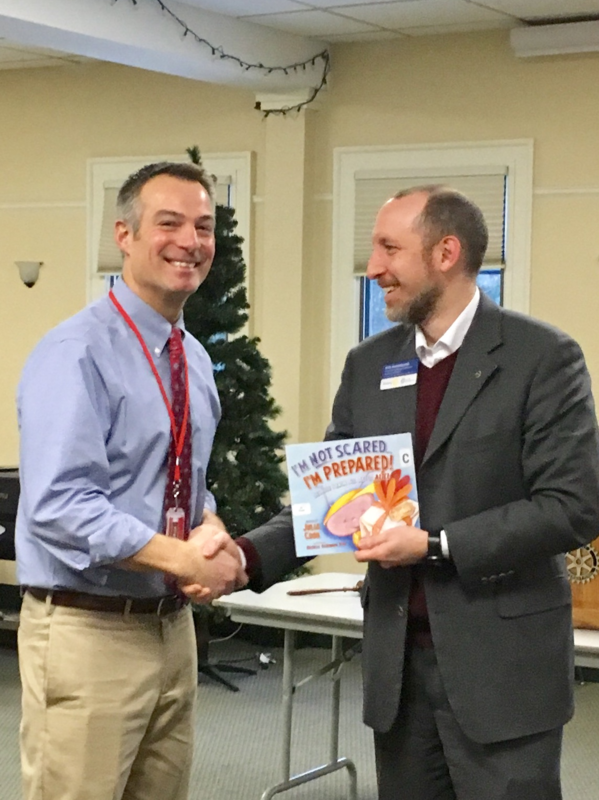 As is the usual practice, Rotarians send letters to their friends (typically the friends who have asked them to donate to their favorite causes) … and the good news is that Ric and his office staff handle the printing of the letters. Before they can provide this valuable service, everyone needs to update their list – and Ric’s office will email those lists to everyone soon for review. Ric pointed out the astonishing fact that last year he had lists from 19 or our more than 60 Rotary members. And we received $25,000 in donations. If everyone gave him a list, we could raise a lot more money. It’s a challenge!! Give him names for your list!! Lara Keenan reminded everyone of the Conversation series talk on March 26 when Fran Stoddard (well-known as host of Profiles on Vermont Public Television) interviews two well-known book illustrators. Since you won’t receive this in time to get to the Conversation event on March 26 at 4 at All Souls Interfaith Gathering, here’s a reminder that next Wednesday, April 2, at 4 at All Souls, Fran will interview nature author Marilyn Webb Neagley – it should be interesting. And it’s free. Sam Feitleberg announced that an exciting raffle will be held to raise money for the Veterans’ Memorial to be built on the Shelburne Parade Ground. Tickets in the raffle are $25 per ticket or $250 for a book of ten. And the prize will be dinner for eight at Rustic Roots on May 21. The drawing will be on May 12. Richard Fox announced an exciting $46 in the pot for the person who might win the lucky draw. He then collected Happy Fines – with a focus on Signs of Spring. Lucky draw – Chris Davis had his ticket drawn, but that was the end of his luck. Maybe next week. Myers Containers Recycling Service was founded in 1994 by Jeff Myers in Winooski as a household waste hauling service. Today it is still a family-owned business, now with three generations of Myers involved, and a tradition of community involvement including working with the Boys and Girls Club and the Cancer Society. Their business continues to expand and evolve with a focus on stimulating economic activity and an exciting new recycling business that earned them a VEDA loan. With the addition of 12 new employees related to the new recycling business, they now have 60 employees in three locations, Colchester, Moretown and St. Johnsbury. The focus of the new recycling center is the recycling of construction and demolition waste. They work with contractors and homeowners to plan the most efficient removal of waste from projects, accept it in a zero sort dump in front of their new building behind Rathe’s, (their building won an award as Best New Heavy Industry Building) where it is hand sorted for recycling. He pointed out that disposal of construction waste earns significant points in the LEED award system. Much of their construction waste is wood which is typically chipped and manufactured into plywood or wood products. They also recycle asphalt, brick and concrete which are crushed and used as road base, and also recycle plastic, metal and cardboard. One of the biggest challenge for recycling is sheetrock which, if put in a landfill, creates a strong sulphur smell as it decomposes. It was the huge amount of sheetrock damaged and dumped following the Tropical Storm Irene that caused the closing of Moretown Landfill. Recycling the sheetrock by stripping off its paper siding and crushing the remainder to make speedy-dry and fertilizer is a better solution. Now there is only one landfill operating in the state. It is in Coventry, which presents problems of fuel, time and road damage as the big trucks haul from all over the state. And it has only 5 to 7 years capacity remaining. Joe said there are three other sites approved but not opened for landfills in the state. The days go quickly as we are so busy. We are having beautiful weather...about 85 degrees each day, sunny, light wind to move the palms. Quick update: volunteers arrived successfully Feb. 1 - some are staying for one week and some for two weeks. Another group will arrive on Feb. 8. We hope the 2nd group will have an easy and successful trip. We always hope that all the luggage arrives. We had a beautiful welcome dinner at Hotel Sherwood, typical Honduran meal and a special cake welcoming all the volunteers. Sunday was a day to not work but to have fun. Some volunteers went to Punta Sal by boat (national park) and they hiked, swam, snorkeled and had a typical lunch. Words to describe from Kathleen (one of our new volunteers from Kentucky) "paradise, relaxing, saw monkeys, spiders, rain forest spectacular, grilled fish w/head and tail on right on the beach". Others who preferred a different experience - we first went to visit the Hogar Materno and see a of Tela. And then we were invited to Dr. and Ana Garcia's home for lunch. Dr. Garcia is a physician at the Tela Hospital and also owns a private clinic. Ana is a teacher at Policarpo school. Dr. Garcia and Ana and their son Roberto came to Vermont in December to visit their daughter Ana who is a scholarship student at Rice High School. They came to our house for dinner one night and are wonderful people and very supportive and helpful for our program. Lots of connections really help our program. They fixed us an outdoor typical lunch prepared on their outdoor Honduran stove. Each day we have an 'end of the day meeting' at 5:30pm to gather and share project reports, stories and it is a time of camaraderie. Great way to learn more. Work: Projects include Las Palmas school where we have worked on and off for about 5 years. Built large double classroom with windows/doors, latrines, water systems, also a 2nd large classroom was started by the previous mayor but was not completed. This trip volunteers have painted the entire school inside and outside. The community has come to help - clean up the grounds, paint the security fence etc etc. We give school supplies, some uniforms. An unanticipated project here is in motion - replacing the tops of the children's desks. Electricity issues will be addressed next week. Also next week we'll have a fluoride clinic at this school. Tres de Mayo school - 3rd year of work at this very rural mountain agricultural school. 2nd classroom completed. Now painting the 2 classrooms interior/exterior. Working on a drainage problem. Renovating a 3rd building that has been unusable due to water drainage problem. Volunteers enjoyed demolishing the roof of this 3rd building and now the process includes raising the walls etc. Many different plans (plan A to now Plan F) have been in motion with this project. Also happening is putting in electricity (they have some computers but no electricity). Next week, we will have a fluoride clinic here. Rec field/park at Colonia Sitraterco with soccer, basketball renovation. This project includes the replacement of the very long rusted out benches - 6 rows. (volunteers will work on replacing those next week) This provides seating for kids watching basketball, having sports presentations etc. Now there is no place to sit for events. Also reinforce the basketball backs, get new hoops, remove vines etc around the fence - the soccer field is in pretty good shape. We plan to have the giving of the soccer equipment/uniforms next week at this park. Fluoride clinics: yesterday we had the first fluoride clinic at IHNFA. 64 fluoride applications were conducted - successful. Wonderful event - we had 4 stations set up so 4 volunteers worked with the children, other volunteers took names and ages. Was a great day at the child care center in the heart of Tela - where we have provided many projects to help them. We love the children there - babies to about age 7. Next week - 4 additional fluoride clinics will be held at schools. Next week - 5 days of Women's Health Clinics - all the preparations have been completed for this including the requested security. You cannot imagine all of the 'behind the scenes' preparations that are going on to make all of this happen! That is happen successfully! Yes it goes regularly from plan A to plan Z. We have not yet begun the Neonatal Intensive Care Unit yet at the hospital. It is due to changes by the government. Al, Dave and I are working diligently to feel comfortable to hopefully begin this very large project. We had a very successful meeting with the new Mayor Mario Fuentes and are very happy with him. We also have had a good meeting with the police. Our relationship with the Tela American School is great. We have 10 of their juniors with us every day to act as translators and help physically with projects. We are very happy with these students who get 'community service' credit. BTW - Al has recovered from his bronchitis. All is going well in Tela which we find very tranquil - we are happy to say we are very comfortable here. Thanks to all who help Hands to Honduras-Tela to be so successful! Wednesday, October 30, 2013, 7:15 a.m.
President Dave Jonah opened the meeting with the Pledge. Kris Engstrom gave the invocation. Quote of the Day: “I was naked and neglected – no food, nothing.” Peter Deng when describing his life before emigrating to the U.S.
Dave Rice thanked all who participated. It went off without a hitch, no problems. Ric Flood reported that there were still nine non-responsive past ball holders. He feels that five are safe, but he feels uncomfortable about the other four, thus putting more pressure on ball sales. “It’s going to be tight.” Fritz requested that all door prizes be brought in today at the latest as the packages are being put together this evening. All the volunteer teams appear to be filled and ready. The set up crew needs to report at 3PM. The cocktails start at 6 with dinner at 7. Everyone should be out by 9:15. Two pumpkin raffle tickets were drawn today with the winners being Carol Obuchowski and Virginia Simmons. A number of plaques recognizing Rotary support for volunteer projects have been made and will be distributed in the coming weeks. Linda Gilbert asked for any members who are cleaning out their storage spaces to donate luggage suitable for carrying extra materials down to Honduras during the next project trip in February. These bags would be used to carry, then will be distributed to needy families in Honduras. Sergeant at Arms – In his battle to ensure that today’s youth get good nutrition, Richard fined anyone who did not intend to hand out healthy food on. Howard Seaver – He lives far out and rarely sees Trick or Treaters, though his wife, Barbara buys masses of candy. Roz Graham – Had a wonderful family reunion in Ontario. She also attended a very interesting meeting of the Vermont Attractions Industry Association in Hildene where she heard that everyone in the tourist industry had a good year last year. And, she has laid in an enormous stock of candy for Halloween. Linda Gilbert – Paid fine as she lives in the woods and never sees Halloween Trick or Treaters. Dave Jonah – Thanks for Dave Rice and all his crew for their great work on making the Halloween Parade such a success. Kris Engstrom – For a great Halloween Parade. John Hammer – Snow fine, there’s snow on the Adirondacks and Greens. Sam Feitelberg – Celebrating his 60th year as a physical therapist. He also warned everyone to read the backside of the Affordable Care Act, as there are changes to the physical therapy coverage for rehab. Check and make sure that you will get the coverage you need. Linda Barker – Had a blast Sunday at the Halloween Parade. She has lots of candy at her bank. Robert Maynes – For missing the Halloween Parade. He was in Maine babysitting. Ric Flood – Sad fine – last Sunday was the first time in ten years that he wasn’t able to suit up to be a clown at the Halloween Parade. Steve Dates – Happy that Teena forced Ric to stay home to get his voice recovered. He thanked all for a great Halloween Parade. Carol Obuchowski – Great parade! Joan Lennes – Almost ready to book a flight to Austria to see her hockey player son. Mark Joczik – Going to Charleston this weekend. Eric Hanley – Just spent the last weekend at duck camp where he had a fantastic time with a 25-year-old tradition. Happy to report that his two girls are active in hockey and for the first goal by Lauren. Dennis Webster – Happy that Peter Deng found us here and for Elizabeth who doesn’t like candy. Bob Bloch – Happy to be here again. Fritz Horton – Happy to have Bob Bloch here. Happy that Bob is President of the Board of the Community Sailing Center. Going over to son Andy’s house because he lives in a target neighborhood where they expect to see 200 Trick or Treaters tomorrow night. Dave Rice – Thanks to everyone for helping with the Halloween Parade and making it so successful. Denny Bowen – Had a nice weekend in Charlotte, NC visiting his daughter, Ingrid. And, yes, he has come back much improved. Howard Seaver – For finally seeing light in the morning when he gets up. John Beal – Wife’s store finally opened. Ric Flood – Paid a notoriety fine for Ric who has been recognized as the best up and coming super lawyer. Steve Dates’ number was called and he drew the Ace of Diamonds. Roll over the pot of $228.50. Speaker – Peter Deng – A new U.S. citizen as of last year. His presentation began with telling his history. He grew up and was orphaned at the age of five in East Central South Sudan. He was taken in by a relative’s family where he was abused, got little to eat and was naked. He decided early that education was the only way out. He went to school on his own and has fought for his education ever since. He came to the U.S. in 2007, and came to the realization that he could help orphans in South Sudan go to school in 2010. He concentrates on orphans in his home state of Jonglei. He started his Deng Opportunities Foundation (DOF) in 2010, starting with two students with a scholarship to a boarding school in Uganda. Since then he has managed to send seven in 2011. They were mostly dropouts with no hope. Now they are doing well. Four graduated in 2013 and they have been replaced. He went home in 2012 to visit his project and his recipients called him, Dad. This brought home to him how important his work was. He has also taken care to have equality in gender because in the South Sudan women are discriminated against. Only 0.01% are educated. They are seen as property to be married off which results in a payment of cows for the bride. Now he is keeping his level at eight students. What keeps him awake at night is the thought that, “I was naked and neglected – no food, nothing.” And there are many children in South Sudan that need the kind of help Peter had to get out of this awful life style. Orphans are especially vulnerable because the girls are sold into marriage, thus bringing a dowry of cows. The orphan boys are seen as a liability because they go out and bring in a woman from another tribe, thus creating the need to provide cows to go out of the tribe. 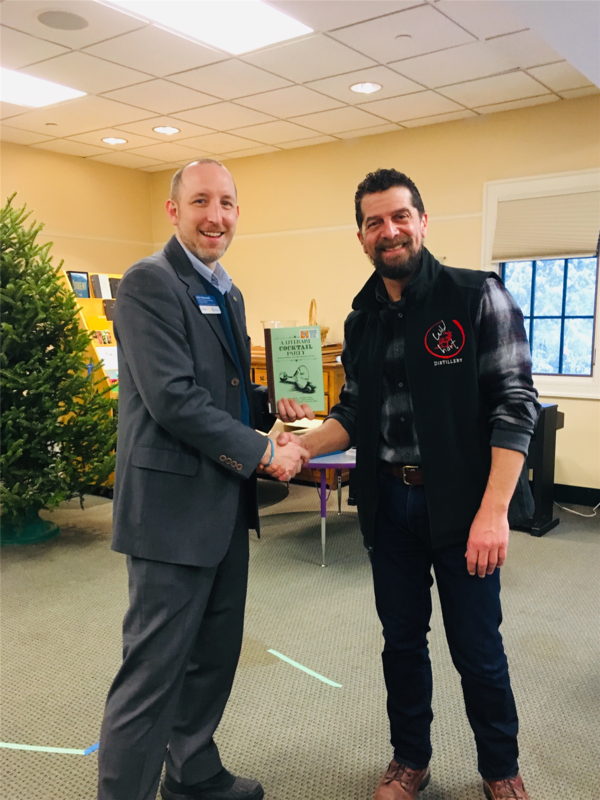 Peter credited his Champlain College ‘Bring Your Own Business’ leader, Bob Bloch, with encouraging him to write his book Lost Generation, the story of his childhood and his coming to America. The book was written by Peter, edited by a Champlain student and published by Champlain College. Profits from sale of the book go to support the work of the foundation. Peter described his businesses, beginning with DOG Express which began with one 14-passenger bus to provide transportation in the area of Bortown in South Sudan where he grew up. He also has established a financial services business that assists people in making money transfers and also encourages them to save and invest. A team of Rotarians worked on the Compost Shed at CCS the past weekend Sept 14. The winners of the Rotary Youth Leadership Awards this year, left to right, Tyler VanDyke from Hinesburg, Graeme Waples from Hinesburg, Karen Pflaster from Charlotte and Meghan Hanley from Shelburne, all students at Champlain Valley Union High School, and Judy Christensen, a member of Charlotte Shelburne Rotary Club and District Chair of the RYLA Program. Linda Gilbert and her husband, Alfonso, both receive, respectively, Rotary International and District 7850 "Service Above Self Award" and "Spouse of the Year Award." Wednesday, April 17, 2013, 7:30 a.m.
Wednesday, April 3, 2013, 7:30 a.m.
Wednesday, March 27, 2013 – 7:30 a.m. It may be better to give than receive, but this year you can do both! The continuing battle against polio. The Golf Ball Drop at the Shelburne Farms Harvest Festival was a great success thanks to all the support form the community and Rotarians. Story of the day to follow. At this week's meeting, 9/12/2012, Terrell Titus presented Judy Christensen the Paul Harris Fellow certificate and Pin, which were not available to present at the Changing of the Guard ceremony. Contrary to the news letter Judy was in attendance at the ceremony. We are happy to celebrate her worthy contribution twice. Normally Rotarians function as servers and cleaners-up. While the food is catered, the Rotarians provide the important support in the distribution and final disposition of the extra foods and as well as the final clean up. The first patients are using the Hogar! There were 3 that stayed, then had their babies and went on home. Now there are 9 patients! Yeah ... it is in action now. Today, we went to the school – La Grande. This is on the side of a mountain about 15 minutes away. There are 190 students in the school. The school operates from 7am to 12pm. The school is well organized and the children are very respectful. It is in a very poor neighborhood and we understand it is dangerous…the children walk from up to one half hour away. A request was made to us for uniforms for the children whose families cannot afford to buy them. To get there, we drove up a very steep and bumpy hill straight up to the school. The road ended at the steel school gate with a heavy metal chain with a padlock. A watchman came and unlocked it and took us in. We were enchanted by the school children and the teachers. The process was lengthy to give the uniforms….each of the children were lined up and we sorted the uniforms by the list given and sizes. Each child received their uniform individually and thanked us. After the teacher showed us another classroom that the community is building – they have the walls but not enough $ for a roof. She also showed us the computer classroom they have which is really nice…they asked for more computers. All the older children were sitting using the computers. This afternoon we went with Pablo to give the bullet proof vests to the policia and then to the bomberos (fire department) to give them a large supply of white t-shirts that they requested. Also…mag flashlights and walkie-talkies. Tonight we go to the Tela Rotary meeting. Desks for the school Tres de Mayo – this is the school that we completed. The rural mountain community had the sides on the school. We completed it with a roof, floor, windows, doors, sidewalk, entrance way…got water to their latrine…painted all. Also, they had no desks – so we have ordered 30 desks for the students and a desk for the teacher and a swivel chair. These have to be transported from San Pedro Sula and will arrive in 10 days to the school. Currently we are finalizing all payments for all projects, transportation and a variety of items. Each payment usually takes us about 3 times as long as we thought it would! Trips back and forth to Juventud, to the Hogar (not open yet but they say within a couple weeks! ), to the projects. Weather has continued to be beautiful with sun, warmth and breezes. This past week was very productive – great weather, sunny every day. Everyone had very positive attitudes and were all so devoted to the projects. Yesterday, 28 volunteers could not leave Vermont in time to make the Newark connection to San Pedro Sula. The problem was late flight into Burlington Fri. night and flight crew didn’t have enough sleep time to leave. Two volunteers did arrive Sat– one from FL flight and one from CA flight. 6 volunteers left Sat. to return to Burlington. We miss them already! This week, there will be 48 volunteers to work on the projects. Today it turned into today all day rain! And big waves – one Honduran had to be saved from the water and is in grave condition. Another person had to be pulled out too and we heard she is ok. Too many people in the water and waves so big – not a good combination. What happens on Sundays – is the people from the rural areas are bused in on school buses. We counted 14 buses…filled with people! They spend the day on the beach –all in front of the small hotels here. And it doesn’t matter if it is raining all day – the water is water than the air. During the week, very few people are swimming so that is the time to go in. Saturday, Colleen, Pam and I went with Pablo to Progreso to order the plaque for the Hogar Materno. Progreso is about 45 min. away and is a large city. We ordered it at an attorneys office and it will be ready by Tues. afternoon – in time for the dedication on Wed. am. Pablo also took us to an Ace hardware where we were able to get all the last items for the Hogar Materno….mirror, waste baskets, hooks, etc etc. We also bought a food processor to give to IHNFA – the day care center that we help. 3 de mayo Agricultural Instituto – roof is on and completed. The interior of the classroom has been filled with sand by our volunteers and the community members – adults and children. 2 translators are assisting. It needs to be leveled and then will be cemented. The community comes in large numbers to help do the manual labor. Colleen and I went to the uniform store and ordered all the uniforms for the students at this school. They need only the shirts not the pants or skirts. The children walk for miles to come to school. Adults also attend as this school teaches a n agricultural profession. Dental clinic – going great. This is being held at the old Tela hospital (UMIS) that is now used for administration of the all the centro de saluds – it also has medical labs and they hold clinics there. Yesterday Julie had 85 patients and extracted 63 teeth. Julie is being assisted by Jose, Brittany – our 17 year old volunteer and two Tela American school translators. Hogar Materno – interior painting is completed. The stenciling around the windows will be done today. The exterior is painted today also. Great volunteer project – because we have two interior bathrooms – they feel like it is like working at ‘club med’. The inauguration for Hogar will be next Thursday. It looks beautiful and we will be putting in the furnishings beginning tomorrow. UMIS – the two rooms that we are renovating to be used for labs…scraping will be done today and painting tomorrow. Bertil and John are working on this with one translator – Oscar. Soccer program – we met with Roberto who heads up the rec program in Tela. He will work with Will and our youth volunteers to organize the ‘gifting’ of the great amount of cleats, uniforms, socks, soccer balls, etc. We also have some bats and mits for baseball. The ceremony to give to all the teams will be Wed. 2/15 at 3:00. One man stopped by to visit the Hogar yesterday and look at it. He was so touched by the building and the idea of what it means to the community – he was drawn to tears. The weather has been great – sunny,not too hot. All is going well. Lois has done fine with the brace/boot. She returns Sat. with 5 other volunteers. 30 new volunteers come on Sat. We will total 48 next week. Hospital to meet Diana, directora – to show her the colors of interior paint for the Hogar Materno. She was very pleased with the selections and they are a go. Tomorrow painting will begin (interior). Quatro de Enero – health care center – project – renovation – new roof, interior renovation to develop exam rooms, waiting area, small farmacia, admittance room, restroom, etc. etc. We met with Dr. Alvarenga, the head nurse, assistant nurse, administrator and the community members at the center. A very heartfelt experience from the community who came in support of the renovation that H2H-T will be doing. Fathers, mothers, a couple youth and small children – talked about how much the health center has meant to them over the many years, and how it almost had to close about two years ago. The community had raised enough $$ to begin a small addition. And H2H-T is stepping in to help complete this dream that they have. Wonderfully sincere Honduras who care so much for their community. We all left very proud of what we will accomplish. This center will be the site of our Women’s Health Clinic and also our Pediatrician will spend time a day here also consulting/helping the nurses. Excellent project. 3 de Mayo – Instituto Agricultura – materials were delivered for the roof Monday afternoon and work began this morning at 6am! UMIS – Headquarters of all of the Center de Saluds (health) in Tela – there are 16 centers. H2H-T project is renovation. We met with the directora Walquiria and toured the rooms that need renovation (this is the very old Tela Hospital that is in big need of help)! Way more than we can accomplish but we have three that we hope can be completed. (Although this is under the Honduran govt they do not receive $$ for renovation.) Walquiria is wonderfully organized and knows exactly what needs to be done and has also asked us for new roof for entire buildings and also electric (does anyone have an extra $100,000?). We are looking into helping with the electric too. Dental Clinic – will be held at UMIS – we inspected the room and there is a dental chair and lamp, sink etc. Will work and there is a waiting area outside. Walquiria will do the advertising for the H2H-T clinic. Campo Elvir Day Care/Kinder center – project – build outdoor kitchen. This is located on a steep mountain side – only can get there by 4 w drive and you need to hold on tight. Wow is it rough. But a beautiful community with vast views of the beautiful Tela mountains, lush bamboo, banana trees, abundant flowers…and wonderful people. The kitchen will be a great addition. We have worked at this site several years, building a kinder, a play area for children, latrines, slope support , etc. Also, H2H-T will provide some play equipment for the intriguing children. Juventud hardware to pick up the paint for the Hogar, ladders and paint supplies – ready to go! Things are falling into place. And the rain is currently falling so heavy that it’s not an outside evening. Had excellent Honduran enchiladas last eve and yummy flan made with coconut milk. Lots of military police and new policemen – seems to be working to have things under control. We are working very hard and by 6pm, our brains need a rest! On Jan. 27, Al, Dave Jonah and I left Vermont driving to Newark (5 ½ hour drive). The weather conditions were rain, slush and possible some ice. Luckily for us, driving south it was just a lot of slush on the highway. This is bad news in case any of you do not know ….About an hour or so into our drive, we were contacted by cell phone with some devastating news about our family of volunteers from 2011 – the Irish-Kassel family – one of their twin 16 year old sons – Zeke Kassel – had been in a terrible accident at 8am and died. We are all so shocked and saddened and our hearts go out to the family. The family of five spent the 4th week last February doing multiple projects with H2H-T. Whatever projects needed to be done, they all enthusiastically participated! I have asked for a basket of fruit, breads, cookies, etc. to be delivered to their home from All of the Hands to Honduras volunteers. Maybe there will be more we can do later. We arrived in Newark and spent the night at Dave’s mother-in-laws house in Boonton (and Ellen fixed us a yummy dinner). Early up on Sat. Jan. 28 to the airport for a 9:00am flight. We met Lois Knapp and Bertil Agell in Newark as they flew from BTV at 6am. Good flight to San Pedro Sula and a very decent landing! We met Norm at SAP as he flew in from Atlanta. Giovanny from Cesar Mariscos met us at the airport. Two suitcases did not make it but we were assured that they would drive them to Tela on Sunday! We rented 2 vehicles and away we went. Everything looked the same – beautifully green, maybe more traffic than previous year. Hotel Sherwood looks great – lots of new touches – new mattresses! And new pillows! And even some new towels! Yeah for Sherwood and Pedrina. Cesar Mariscos looks equally beautiful and fun to see how much Rodrigo has grown. 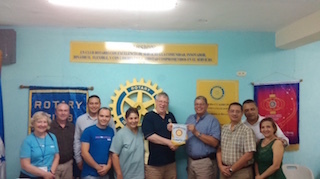 We arrived about 4pm and 5pm, 4 of the Tela Rotary came to greet us and meet about the 3 de Mayo ag instituto classroom project. We had a very good visit and got started on the details of the project. After they left, heavy rain came but we were determined (and hungry) to go to the Italian pizza café just down the beach. Walked in heavy rain through the big puddles but a yummy pizza is worth it. Big lightning storm, winds, big thunder and more rain. Sun. morning brought sun, swaying palm trees, Honduran tipico breakfast and delicious fruit. Plans were to meet the Rotarians and the director of the Ag Insituto and drive to take a look at the project site. It is about 15 minutes from hotels through some beautiful countryside on a quite bumpy road. It will be a favorite site again as is very interesting. The project is to complete a school classroom that was started 3 years ago. It is about 26 ft by 20 ft and has the cement block walls up but no roof, no floor, no windows etc. The ag instituto is for students age 6th grade and up. 70 students and they walk to the school from as far away as 3 miles. The school is a technical school and teaches students a profession in agriculture. We believe there are many opportunities for work with this school. Tomorrow I am going to the bank to change travelers checks to pay for the materials for the roof as that is going up immediately. We met with the community person who will put on the roof. We also went to Las Palmas to check out the school and the latrines. Project there will be to paint the latrine building that H2H-T built last year. Next stop was the Hogar Materno Expectant Mother Center at the hospital. BYW – nurses are on stike there – I think this is throughout Honduras but not sure. So impressive and we are so pleased with the building. We will begin painting this week after we sweep it. It looks so good! And no the electricity still is not connected! More later…..
We may be go to 4 de Enero Health Center this afternoon to check out that project. If not today then tomorrow! So far, we are very comfortable here in Tela. People are happy. From all we speak with, we are ok here. And it feels good to be back in tranquil Tela. Hasta pronto! Please email me with any questions. 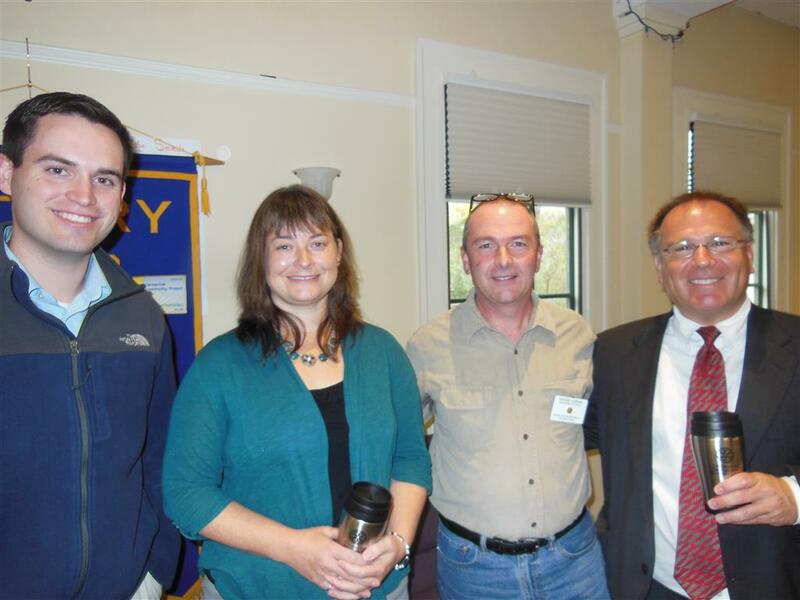 Susan McLellan presenting the club’s check for Irene relief to the Northfield Rotary Club on 12/15/11. Northfield president is Nicole DiDomenico. Steve Dates and Fritz Horton presenting $1,000 for flood relief to Lorraine Keener, President of The Mad River Valley Rotary Club. Seems like we had lots of folks helping out with food at the Halloween parade. The beginning breakdown of hotdog roll packages into napkin wrapped rolls was done quicker than helpers remembered. We had conversation time . We also had time to sample the goods to make sure the hotdogs and donuts were of a quality that we could allow others to consume them. The popcorn was cupped and then the soda cupping began. The crowds came early this year about <?xml:namespace prefix = st1 ns = "urn:schemas-microsoft-com:office:smarttags" />2:00 and we thought we had everything under control. And we were confused because the first crowds didn’t finish off much. We think the first rush was from Museum crowds. Then the parade participants arrived at their usual time and we really had to hustle. We knew the parade was over because the all of the clowns, there are many, returned. Water then cider ran out first as we organized the cups and poured soda for the hoards that descended upon us. Consumption had started for real. The hot dogs were flying out of the pot and the mustard and catsup stand was crowded. And then they were finished and it was earlier than usual. And we went back to conversation. 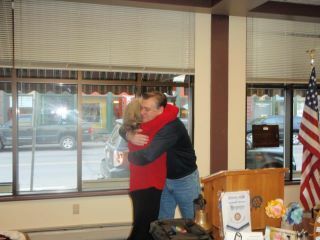 Charlotte Shelburne Rotary President, Kris Engstrom gets big hug from Waterbury Rotary president Eric Smith after presenting the club with a $1000 check to be used at their discretion for the Irene efforts!. The Rotary Club of Charlotte-Shelburne regularly provides support to events that take place at the Charlotte Ssenior Center. One of these events which occurs every summer is a BBQ held for participants in various health-related exercises. This year this event was held on Friday, August 26. While the Rotarians usually do the cooking, this year, the grilling was done by townsfolk and the Rotarians provided support from food preparation and presentation. Work included setting up and breaking down the tents, setting up the tables and chairs, preparing place settings, and all the operations associated with food service as well as overall oversight and accomplishing of clearing and cleaning. Rotarians this year who were involved were: John Hammer, Denny Bowen, Todd Whitaker, Colleen Haag, Joan Lenes, Carol Geske, Linda Gilbert, and Chuck LaClair. The latest Charlotte-Shelburne Rotary community service effort started early in the morning on Tuesday, July 26th. Volunteers cooked breakfast for approximately 200 attendees and staffers at Camp Ta-Kum-Ta. Located in South Hero, Camp Ta-Kum-Ta provides children with cancer a one-week opportunity to forget their disease by giving them the chance to play, swim, and have fun like normal kids in an environment specially staffed to handle their medical needs. Rotary members reaped instant rewards from their work by getting the chance to watch the camp in action. A flag-raising ceremony, sing-along, and skits led by Camp Ta-Kum-Ta’s very positive team members resulted in plenty of smiles, both from the campers and the Rotary volunteers who were lucky enough to be there. Plans are already being made to serve breakfast again in 2012.